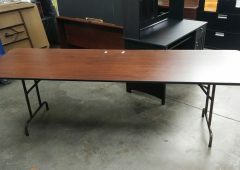 Lorell Ultra-Light Banquet Table 30" x 72" Rectangular banquet table is designed for light-duty use indoors or outdoors. Capacity indicated refers to weight evenly distributed. The 2" thick, square-edge top is made of blow-molded, high-density polyethylene for a sturdy surface. 1" tubular steel legs are powder-coated for durability. Blow-molded, high-density polyethylene top with square edges and round steel legs Holds up to 500 lb. evenly distributed Lightweight for easy portability indoors or outdoors Dimensions: 29"H x 72"W x 30"D Compare At: $ Our Price: $* *ONLY 10 LEFT IN STOCK-HURRY, WHILE SUPPLIES LAST!